Designed to provide a simple, secure method of mechanically fixing verge tiles on properties. Reduces the risk of wind damage and water penetration. 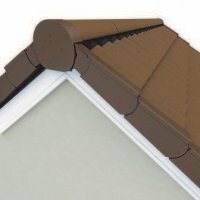 Ridge Cap Angled Suitable on new build roofs or roofs where the extisting verge is being renewed. D..
Starter Piece Suitable on new build roofs or roofs where the extisting verge is being renewed. Desi..